« July 2018 Newsletter – High Summer is here! May 2018 Newsletter - Opening Day is near! Although we’ve been busy in the greenhouse and the fields for months now, and have been attending the Union Square Somerville and Central Square Cambridge markets for a few weeks, and will be attending Central Square tomorrow on Memorial Day (regular hours! ), our official ‘Season’ has yet to begin. We have decided that it will begin precisely at 11 AM on the morning of Friday, June 1st, at which point the farmstand doors will open up, revealing the fruits of our early labor. And I use the word ‘fruits’ loosely, because, although we may have a few strawberries by then, most of our offerings will be things like lettuce, arugula, radishes, kale, spinach, asparagus, parsley, cilantro, dill, endive, escarole, and garden plants. I guess some folks think of rhubarb as a fruit, and we’ll have plenty of that. As we get deeper into June, we expect to see squash, basil, cucumbers, beets, garlic tops and chard, and we hope to see abundant strawberries and peas. For the most accurate and up-to-date list of what should be available each day check our website, but if you’re making a special trip for something specific, call during our open hours to see if it’s available. Be aware that our policy is not to hold items (except rutabagas) for customers, but at least you can find out whether we’re likely to have what you’re looking for. When we officially open, our self-service offerings will be limited to plants and compost – farmstand hours will be 11-6 daily except Mondays, when we will be closed. In addition, we will be attending our usual three weekly farmer’s markets, two of which have already begun: Mondays from 12-6 at Central Square, Cambridge; and Saturdays 9-1 at Union Square, Somerville. The third market, Thursdays 2-6:30 at Belmont Center, will begin the afternoon of June 7th. We hope you all had a restful winter and are looking forward to another season of fresh fruits and veggies from Hutchins. 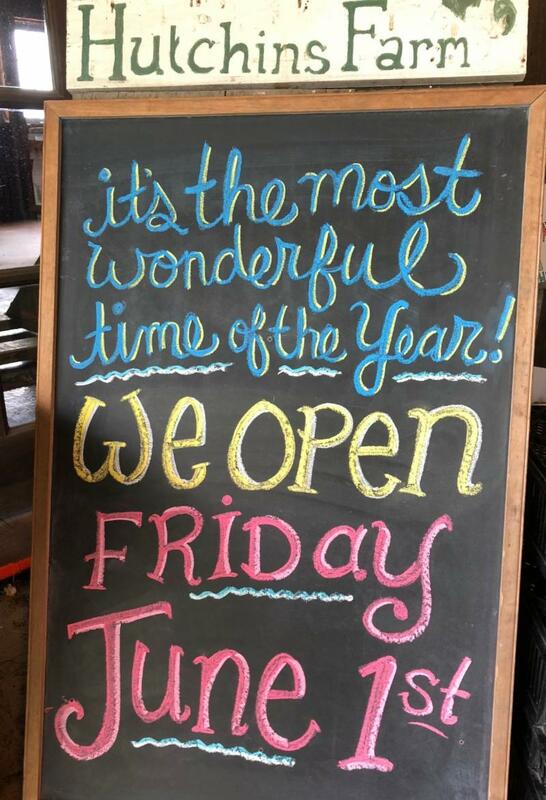 Opening Day is Friday, June 1st!